No more parking at Miller Beach if you are planning on going to be out past the street lights coming on. Is there anywhere in HIghlands (or close by) where someone can enjoy the beach at night without a pass or permit? This will be the case until the chain closing it off rusts…. and everyone forgets about the whole deal……. Or it goes missing. Or it is cut. Why ? What is the reason? Most parks, (Hartshorne, Sandy Hook, Henry Hudson trail etc) close their parking at dusk. Miller beach has had its share of complaints over late night hijinks/noise etc there. 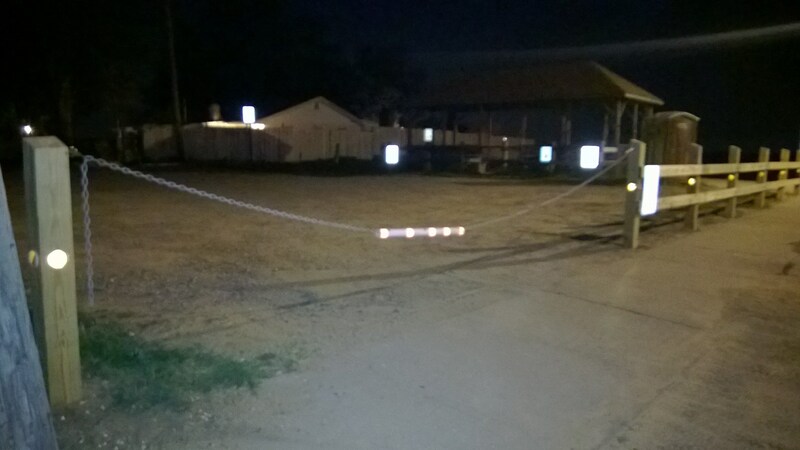 First they put a large blinky sign that said “Beach Closed at Dusk” but that just became a table for late night partiers to put their Miller Light bottles on, so the town officials are now trying a chain across the entrance. The town has started enforcing this. There were some tickets issued this weekend. If you find your car locked in the lot, just find someone to hold the chain up & you can drive under it. As long as your vehicle isn’t tall (not sure an SUV would get under it), you don’t have to be stranded. You’re welcome. Did they ticket cars in the lot before locking up? It would be funny if someone put their car *in* the lot after they closed using the same technique.. That would confuse who ever came to unlock in the morning.. They ticket them lock em in. So far we’ve seen 3 escape routes… 1. Have someone hold up the chain. 2 drive onto the beach then out onto Miller. 3 drive onto Flo’s property then Private Road, then Miller. Some foolio did #3 last night and nearly hit my stone wall. note to ticket receivers: You can go here http://njcourts.judiciary.state.nj.us/njmcdirect/atswepr2/ticket/search/entry.do to pay your ticket online.. why go to court, its just easier..